Now that it's officially spring, it's time to put some zing in your step--and in your wine glass, too. If you've got a bit of the late winter doldrums, why not get yourself a bottle of Sauvignon Blanc from New Zealand? This always does the trick for me, and puts me in the mood for the warmer months and longer days ahead. I've had two bottles of New Zealand Sauvignon Blanc recently that I liked. Both qualify as excellent QPR, and come in at different price points. One is just under $20, and the other just under $15. 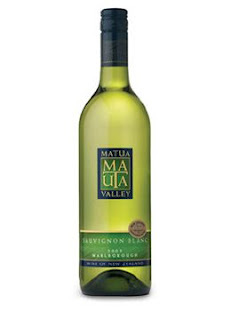 The 2008 Matua Sauvignon Blanc Lime is the more straightforward of the two, and has the lower price point. (suggested retail $13; available for $7-$19) At present, this wine is all about the lime. There is tangy lime zest in the aromas, and lime juice in the palate with fresh herbal notes coming forward as the wine is exposed to air. It's tang and refreshing--the perfect spring into summer sipper. The 2008 Kim Crawford Sauvignon Blanc has greater complexity and a slightly higher pricepoint--but it's still a great buy. (suggested retail $19; available for $14-23) Year in and year out this is a winner. This year, the wine has persistent, focused pink grapefruit and lime zest aromas and flavors. Herbal and mineral notes linger in your mouth after you've swallowed. This is an exceptionally flavorful wine for the price, and a great example of New Zealand Sauvignon Blanc. You can't go wrong with either of these wines this spring. Today on Serious Grape: What Wine Goes with Fish? This week on Serious Grape, my weekly column on Serious Eats, I tackle the issue of what wine goes with fish. My particular object of inquiry is salmon. I can't get enough salmon in the spring, and I'm guessing it's showing up on your table, too. 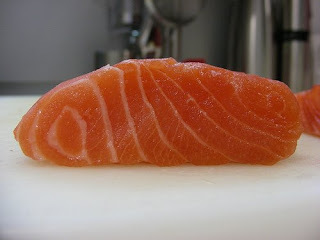 Click on over to find a great salmon recipe from fellow-blogger Rick Bakas of the Back to Bakas blog, and a side-by-side tasting comparison of how the dish fared with two wines--one red, one white. What do you have with salmon? And after reading the article, are you inclined to give something new a try? This month two fellow wine bloggers joined me in taking a wine adventure in France led by wine merchant extraordinaire Kermit Lynch. 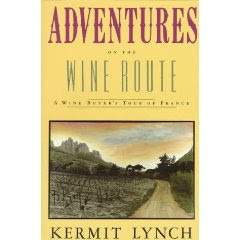 This March, the Wine Book Club read Lynch's Adventures on the Wine Route: A Wine Buyer's Tour of France. It's a classic of the genre, combining an insider's perspective on wine with a traveler's tale of people, places, and things that Lynch encountered while en route seeking out great bottles to bring back for his customers in the United States. Frank at Drink What You Like is taken with Lynch's fancy for "natural wines," but finds them difficult to find in his neck of the woods in Southern Virginia. He stocks up on them when he's in San Francisco, and liked the way Lynch was able to transmit his "excitement and passion" for wine throughout his book. 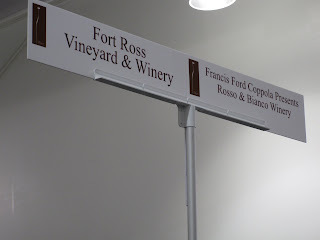 Frank noted that Lynch was a pioneer in shipping wine in refrigerated containers, and that he has strong opinions about the problems associated with evaluating wine based on blind-tastings without food. A road-warrior himself, Frank celebrated his first full week at home this year with a Lynch-inspired menu of oysters and a nice bottle of Chablis! 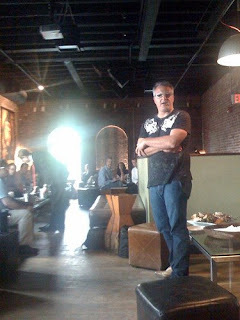 Kori at The Wine Peeps also mentioned Lynch's innovative methods of shipping wine and his feelings about blind tastings. Kori and her dad, John, are proponents of blind tasting (though they do taste with food). This was a re-read for Kori, who first picked the book up when she went to Bordeaux in 2003, and would "still recommend it today, even though it is a bit dated." She found her favorite quote from the book on a dog-eared page: “One cannot do justice to a great bottle alone. Someone with whom to ooh and aah is indispensable, someone with whom to share the intellectual and aesthetic stimulation that a great bottle inspires.” Isn't that one of the great joys of picking up a book that you've read before? To see what struck you the first time? Finally, she especially recommends the book "if you ever plan to visit the wine regions of France." For me, one of the most powerful aspects of the book came at the very beginning where Lynch contrasted the American approach to wine, "with our New World innocence and democratic sensibilities," which tends to make us feel that "all wines are created equal," with the French apporach. "The French," Lynch writes, "with they aristocratic heritage, their experience and tradition," have their "grand crus, premiers crus, and there is even an official niche for the commoners, the vins de table." This contrast worked on me throughout the book, and I felt like it announced at the outset that what Lynch experienced in France was a completely different world of wine that he was eager to explain and share with those of us still living in "New World innocence." I'm not sure we're still that innocent, but I agree that we approach wine very differently from Europeans and Lynch helped to clarify that for me. Thanks to Frank and Kori for once more joining me in reading a great book about wine. I'll be announcing next month's title next week--and hope that you will consider joining us for the April Wine Book Club. I've been known to rant about over-oaked wine. I don't like the taste of synthetic wood, or when oak has been used with such heavy-handedness that you might as well be sipping your favorite beverage through a mouthfull of toothpicks. 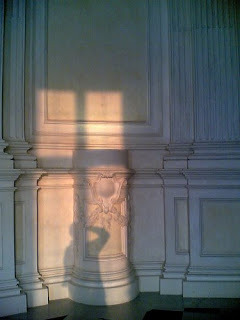 But there are moments when you want a bit of oak. These include those times you have a hankering for homemade clam chowder with lots of bacon and some toasty roux thickening the soup. Whenever I make this recipe for Panhandle Clam Chowder, for instance, all I want with it is an oaked Chardonnay. But I still want one that balances out the oak with fresh fruit flavors. I found a good option in the 2007 Ravenswood Chardonnay Vintner's Blend. (suggested retail $10; available for $6-$16). The wine had buttery pear and baked apple aromas and flavors, with lots of creaminess in the midpalate and a creamy finish. Though you could taste the oak, it was not overwhelming and the wine retained its balanced freshness perhaps because while half of the wine was fermented in barrels, the other half was fermented in stainless steel. In any case, it's an excellent QPR choice for people who like richer Chardonnays. Does It Make Sense to Cellar Wine Under $20? Today's wine marks the end of my journey through the Italian region of Piedmont and my first review of Nebbiolo on GWU$20. It also represents an opportunity to explore whether or not it makes any sense at all to cellar a wine that costs less than $20. Most of the wines reviewed on this blog are ready to drink on release. Many will improve and taste even better in 6-12 months. Some need more time--say 12-18 months. 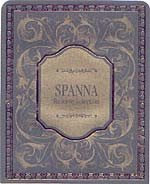 But the 2001 Dessilani Spanna Riserva that I opened up recently provided a ringing endorsement for the idea that some wine--not terribly expensive, to be sure, but made with a grape that rewards patience--can be held for three years and make you happy that you waited so long before drinking it. The 2001 Dessilani Spanna Riserva was a spectacularly good example of a budget-friendly Nebbiolo, one of the Piedmont's most illustrious and coveted grapes. I paid $12.99 for this bottle of wine at BevMo back in March 2006. More recent vintages will now cost you $15-$26. Three years later, in March 2009, this wine had blossomed into a beauty. It had aromas of violets, black tea, charcoal grill, and plums. The wine was fairly drying on the tongue even now--eight years past harvest--and earlier tasting notes on CellarTracker! indicate that it was a fairly challenging wine when it was young. Now, however, it revealed meaty and plummy flavors with silky, well-integrated tannins and hints of cedar in the aftertaste. It was best within several hours of first opening, but continued to be drinkable through the second day. Will all inexpensive wine improve with age? Absolutely not. But it's worth doing your research to find out what grapes--like Nebbiolo--do benefit from a few extra months in the bottle. What have your experiences been with cellaring inexpensive wine? Sorry for the delay in posting, but on Friday my weekly column on Serious Eats focused on the recent Family Winemakers of California tasting I attended. This is a tasting I look forward to each year. If you don't know what a Family Winemaker is, head over to Serious Grape and check out what the association stands for, and what it promotes. You'll also get a lead on a great $20 bottle of wine made by a young winemaker you'll be glad to know about. This weekend marks the official end of winter and the official beginning of spring. If--like me--you feel you need to clean out some of the winter cobwebs but aren't yet ready to find your flip-flops and light the grill, why not make up a dish that perfectly bridges the seasons? Invite a few friends around, open a bottle of wine, and enjoy. The Food: I love recipes that call for about 30 minutes of active stove time, but require an additional hour of cooking time during which you can sit and relax with your friends while the whole house fills up with delicious aromas. This recipe for Lemon Confit Chicken is a luscious, chic update on what we always called "chicken in a pot," those old-fashioned recipes that called for chicken parts and a Dutch oven. The recipe feeds four, and calls for one special ingredient--preserved lemons--that I found in my local Whole Foods store (in the salad bar believe it or not). The dish itself turns out zesty and flavorful, with loads of fresh lemon flavor and wonderful, spicy notes of ginger and saffron. A box of couscous takes under 10 minutes to prepare and makes the perfect accompaniment. 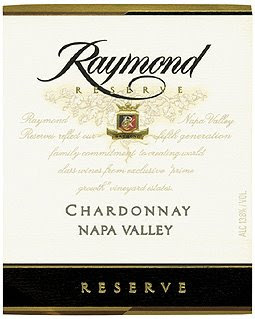 The Wine: With this dish you need a lemony, lightly oaked chardonnay like the 2007 Raymond Vineyard & Cellar Reserve Chardonnay (suggested retail $20; available for around $15) This is an excellent QPR, beautifully-balanced wine. It has smooth apple, pear, and citrus aromas and flavors. There is an oak-kissed aftertaste, which results from the winemaker's decision to put 50% of the juice for this wine in French oak barrels for 2 months. This is a feather-light oak treatment, and it makes the wine rich without being woody. The wine retains its nice freshness as a result, and is the perfect partner to got with the lemony chicken. It's Wine Blogging Wednesday again, the online monthly tasting event originally conceived by Lenn Thompson of Lenndevours. 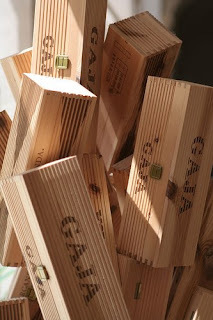 This month the theme was set by Remy Charest of The Wine Case blog. His instructions were for us to pit the north against the south--but after that he was pretty flexible. You could compare wines from different countries, different regions, or even different parts of the same appellation. Because I'm trying to come to terms with the wines of Washington state, I decided to drink a Washington state Merlot (north) alongside a Napa Valley Merlot (south). 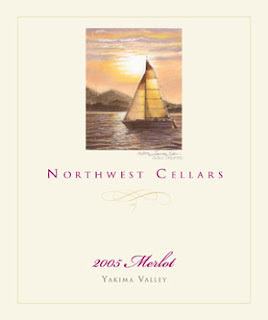 The 2005 Northwest Cellars Merlot was an excellent QPR bottling blended from 75% Merlot, 13% Syrah, and 12% Cabernet Sauvignon. (suggested retail, $15) Slow to open, the wine developed to reveal plum and cassis aromas with a bright raspberry note. The flavors underwent a metamorphosis from a simple taste of fresh plums to something darker and more complex, with plums, graphite, and smoke. There was some green stemminess as well--which I always like in Merlot--and the rich aftertaste was luscious with milk chocolate notes. This was an uneniably complex and elegant wine, and would be enough to convince any Merlot skeptic still having horrible flashbacks from the 90s that the grape is worth a second try. 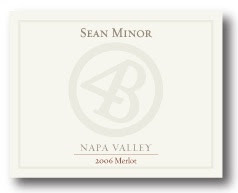 For my "south" bottle I opened up the 2006 Sean Minor 4 Bears Merlot from the Napa Valley. (suggested retail $17; available for $10-$18) This very good QPR Merlot opened at first to rich, slightly confected cherry-berry aromas with a hint of green pepper in the undertow. Plum and cherry fruit blended with herbal notes in the flavors, and this rich profile was accentuated with cedar and allspice. The aftertaste was chalky and slightly drying, but this smoothed out with time and air. The wine continued to deepen and gain weight and complexity over the two days that I sipped it. I think that both of these wines will be even better in 6-12 months than they are now, which makes them good candidates for short-term cellaring. Merlot is a versatile grape food-wise, and will bear as well with summer barbecue and burgers as it will with next autumn's pot roasts, so if you like Merlot I'd stock up on these beauties now. Drinking one variety from two distinct locations was a great learning experience for me. Going in to it, I would have expected more chocolatey richness from the Napa Wine, and more herbal notes in the Washington wine. My tasting showed just the reverse. Both of these wines were keepers, though, in my book. Thanks to Remy for a great theme, and I'll see you back here for WBW #56 next month. Full disclosure: I received both of this wines as samples. I'm continuing to explore the Italian wine region of Piedmont this month, and today I have a new grape: Cortese. Cortese is a grape indigenous to the Piedmont that makes bright, refreshing white wines. If you want to know more, follow the link to AbleGrape where (as the founder so rightly reminded me!) there is lots of information available. Like many Italian whites, Cortese is lean and acidic--a far cry from the fruit-bombs many of us are used to drinking. As such it represents a delightful change of pace and gives your palate a good spring cleaning. 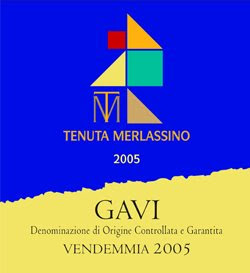 Recently I tried the 2006 Tenuta Merlassino Gavi, a very good QPR example of the grape. ($16.84, Garagiste; available elsewhere for around $20) Though the label here is for the 2005, we drank the 2006 and the label was identical. There were characteristic aromas of oily minerals, apple, and bitter almond. These aromas were followed up with flavors of apple and stony mineral water (Vitel was my pick) which were rounded up with a bitter aftertaste. The texture of the wine was slightly spritzy on first opening, then it smoothed out into a wine with a medium-bodied mouthfeel. Fish is the typical food pairing for a Cortese, but I wanted to pick out the oily mineral notes and so made orecchiette with fresh tomatoes and an almond-pecorino pesto. The almonds did just what I hoped they would--they picked out the mineral and turned them nutty. And the wine's bracing acidity stood up nicely to the tomates and the basil. If you like Italian whites--Pinot Grigio, Vermentino, Verdecchio, Garganega--I think you'll like Cortese. Give it a try if you see it on the shelf. Today on Serious Grape, my weekly column on Serious Eats, I take up the controversial subject of restaurant corkage fees. (photo by neeta_lind). Some grumble that $15-$20 is too much to pay for someone to open your wine and occasionally pour from the bottle. Others never buy off the wine list, and prefer to bring their own wine. I'm a novice at this, but my recent experiences taking wine into restaurants lead me to think that corkage fees are a small price to pay for drinking good wine without going bankrupt. Click over to the post and see what you think. 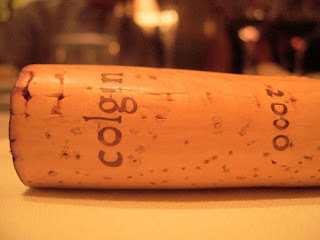 And leave your comments--here or there--about your experiences with corkage. Do you accept it? Hate it? And are you taking wine to restaurants more now that wallets are tightening? When the going gets tough, the tough turn to comfort food. This week on Friday Nights IN, I recommend a blast from the past to help lift your spirits and remind you that these hard times will pass: meatloaf and mashed potatoes. This meal will serve six, plus leave leftovers for the all-important meatloaf sandwiches the next day. The Meal: Meatloaf, Mashed Potatoes and Green Beans. Good meatloaf is a joy that many of us forget about in our era of sautee pans and outdoor grills. When looking for comfort recipese, I turn to the Joy of Cooking, the classic American cookbook we all grew up with. Their meatloaf is miraculous, and I recommend you take their advice and use quick-cooking oats in lieu of bread crumbs for a lighter, less gummy end product. Also, we use 1/2 ketchup and 1/2 chili sauce in the mix, and then put 2 T of chili sauce on top for the final 30 minutes of baking. This makes all the difference. If you don't have the Joy of Cooking, call your mother or your aunt. They do, and can read the recipe to you. For your mashed potatoes, our household secret ingredient is cream cheese. A little Philly cream cheese and some chicken stock in your mashed potatoes--in lieu of cream and better--will give them some extra oomph. Steam some green beans, and you'll be transported to 1969. The Wine: With such a traditional, comforting meal you want a traditional, comforting wine. My choice would be a fruit-forward Cabernet Sauvignon from California's Central Coast. 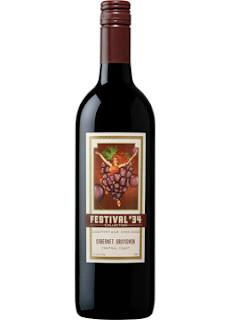 A new release I would recommend is the 2006 Festival '34 Cabernet Sauvignon from C&B Vintage Cellars. (available for $7-$15) The wine has blackberry and raspberry aromas and flavors with a hint of milk chocolate. Notes of cedar and cassis liqueur emerge in the aftertaste, which remains bright and lively. A few months back in my weekly column Serious Grape, I was lamenting the fact that nobody was exploring the use of barrels as a way to reduce wine's carbon footprint. Lots of explanations were given as to why we don't go back to the barrels--from storage space to licensing laws. None of them struck me as insurmountable. Happily, the folks at Red Truck Wines have decided to see just how far they can push alternative packing forward--by going back to barrels. This makes huge sense to me. And hopefully it will to you, too. For just $29.99 (suggested retail), you will soon be able to get your very own barrel of 2007 Red Truck Red Wine, a blend of Syrah, Petite Sirah, Cabernet Franc, and Merlot. I haven't had the 2007 (yet) but previous vintages have struck me as the perfect, easy-going, fruit-forward house red. The mini-barrel, as they call it, holds the equivalent of four 750ml bottles of wine. I'm not a math whiz, but I think that works out to $7.50 a bottle. There is a tap on the side that keeps air out of the wine and the barrel is equipped with a special gizmo that means you don't have to tilt the barrel to get the last of the wine out of it. And it even has little feet, so it will sit on your cool, dark counter without rolling around. How long will the wine stay fresh? The winery says 40 days--a claim I'm eager to put to the test (although I doubt the wine will last that long). The mini-barrels will debut this month in Sam's Club stores, and be available through other retailers within the year. Who's headed straight to Sam's Club with me? If you drink a lot of wine, you probably have a few that serve as your "benchmark bottles." These are the wines that set the standard against which you judge similar wines from other producers, other vintages, or even use to compare grape varieties across the globe. When it comes to Zinfandel, my benchmark bottling--the one that sets the gold standard for me--has been Dry Creek Vineyard's Heritage Zinfandel (suggested retail $17; available for $12-$20). 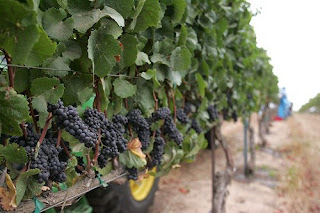 Year in and year out the folks at Dry Creek Vineyard produce a wine that is balanced between fruit and spice. Even better, they don't overdo the alcohol and as a result I can have more than one glass if I want to without regretting it the next morning. If you want to know more about Dry Creek Vineyard and the people behind the wine, check out their blog, Wilma's Wine World. Like previous vintages of this wine, the 2006 Dry Creek Vineyard's Heritage Zinfandel represents excellent QPR. The wine is predominantly Zinfandel (88%) with some Petite Sirah blended in (12%). It has a rich, dark color and abundant blackberry aromas. The blackberry fruit carries forward into the flavors, where there are also layers of black pepper and baking spices. The wine's overall impression is rich and spicy, but not heavy thanks to the bright fruit at the core. I've been missing North Carolina, and so we had our Zinfandel with a time-saving take on Carolina-style BBQ: pulled chicken sandwiches with coleslaw. For those who don't know, not all BBQ sauce is tomato-based. This one is vinegar-based, with red peppers and other spices. You shred a store-bought roast chicken into the cooked sauce, pile it on a bun with some coleslaw, and you're as close to North Carolina as you can get without a plane ticket and a BBQ pit. Only a Zinfandel like this one could stand up to that vinegar without clashing, and the blackberry fruit was a nice foil to the spiciness of the sauce. This vintage confirmed what I already knew. When it comes to Zinfandel, I've got my benchmark and it's from Dry Creek Vineyards. I love Cabernet from my home state, but they can be prohibitively expensive, hard to find, or both. What I can find in the wine stores and supermarkets is often blah and boring. Recently I tasted through a wide variety of Cabernet Sauvignons. Click over to Serious Grape, my weekly column on Serious Eats, to see what I thought were the best in the $10 and under category, the $10-$15 category, the $15-$20 category, and the $20-$25 category. No matter what your budgetary ceiling, if you love Cabernet from California I've got a recommendation for you. This March, why not take a mini-vacation along France's viticultural byways? The reason I picked this classic wine book for March's assignment is because most wine lovers have no idea how the wine on the shelves of their local stores actually arrives there. When living in northern California, I was fortunate to be able to buy wine off of Kermit Lynch's shelves in Berkeley. His taste for great wine meant that what was in his store was intriguing and exciting. This book explains that this level of quality was no accident--it was the result of his travels around France. This book is one part travel tale and one part wine diary. The rest is filled in with wonderful character sketches and Kermit Lynch's sense of humor and whimsy. I think you'll enjoy it. If you want to participate, please read the book and post your reactions to it on your blog or other website by Wednesday, March 25 at 5 pm. Send me a link via email or in the comments to this post or my review later this month. I'll post a roundup as usual on the last Thursday, March 26. As I mentioned in yesterday's announcement post, Italy's Piedmont region is blessed with a number of indigenous grapes that produce distinctive wines. This month, I'm beginning my journey into Piedmont with a blended red wine that was brought into the US by wine impresario Randall Grahm back when Bonny Doon expanded (briefly) into the negociant and importer biz. Since this wine was bottled and sold, Grahm has abandoned this venture to focus on biodynamic winemaking--which is too bad, because this wine represented very good QPR. And I'm not the only blogger to think so. Check out the reaction from Taster A at the blog Smells Like Grape. The 2005 Bonny Doon Monferrato Rosso Piemontese Blend was an interesting wine that, though a bit tight and flat at first, opened up nicely over the course of the evening. 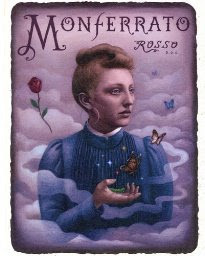 It was blended from 70% Ruche, an indigenous Piedmont grape, 20% Barbera and 10% Syrah. Even when first opened, there were heady aromas of white flowers and plums, and these deepened and got more complex and less overtly perfumey as time passed. The flavors reminded me of pomegranate and cherries, and there was a juicy, spicy aftertaste. This wine has lots of acidity from the combination of Ruche and Barbera, which makes it an excellent and adaptable food wine. I got this from the Bonny Doon Wine Club over two years ago, in February of 2007, for $15.30. You can't get it any more--at least not as far as I can tell. However, this wine was actually made by Luca Ferraris, a well-known winemaker from the region and you can find their Ruche for between $18 and $25. Based on the tasting notes on CellarTracker the wine has evolved quite nicely during the two years it has been in my cellar. So if you do go ahead and get some of Ferraris's Ruche, you may want to give it 3-4 years after the vintage date to develop the fruit flavors to go with the upfront aromatics. Italy's Piedmont shares borders with France and Switzerland along the formidable natural boundary of the Alps. Tough growing conditions lead to small yields--even though this is Italy's largest (and one of its most productive) regions. The Piedmont's sparkling wine from Asti, for example, is second only to Champagne in terms of overall sparkling wine production. 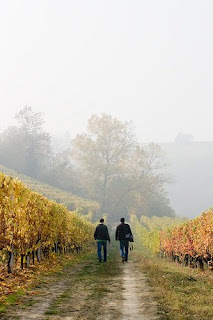 I picked up plenty of tips from last month's Wine Blogging Wednesday, but if you have anything to add--from wines to try to insights into what inspires you about wines from the Piedmont--please leave them in the comments below. I'll have my first review of a red wine from the region tomorrow. Saturday was the 10th annual Open That Bottle Night. Dorothy Gaiter and John Brecher, the wine critics from The Wall Street Journal began the event because so many people have wine in their house that they think is too "special" to drink. The result? When something finally happens that constitutes a "special" occasion, the wine is over the hill and can't be enjoyed anymore. Open That Bottle Night gives you the permission to say "today is the day" and pull the cork on that expensive, rare, or sentimentally significant bottle. As you might imagine, the bottles I hang on to are the ones that cost me more than $20. After a disaster or two I no longer set aside "special occasion" bottles, but I do tend to be reluctant to open something outside my normal price range. So I opened up a bottle of Scholium Wine, the project to push the wine envelope started up by former philosophy professor Abe Schooner. (photo of Abe Schooner taken by fellow blogger Dale Cruse, from the blog Drinks Are On Me) I'm on their mailing list, and get a chance twice a year to buy Abe's wine. One reason I like Scholium is because it's out-of-the-box wine making. Usually, I'm a correct varietal characteristics maniac, and want my Cabernet Sauvignon to taste like it's supposed to. With Scholium I make an exception. Nothing Abe does with grapes fits a textbook description and his wines are a wine-drinking adventure as a result. And I'm not alone in thinking so. Other wine bloggers enjoy the challenges associated with opening up a Scholium wine and abandoning their preconceived notions of what wine should be. Check out RJ's post on Scholium at RJ's Wine Blog for an example, or Richard the Passionate Foodie's experience meeting Abe. That spirit of adventure was certainly part of the 2007 Scholium Project "The Prince In His Caves" Farina Vineyard Sauvignon Blanc ($45 through the mailing list; you can get other vintages for between $45 and $49 from these merchants). I just adored this wine, but all the while I had to abandon my idea of what Sauvignon Blanc was "supposed" to be. It opened up to a cloudy orange-yellow that resembled flat beer. Initially, there was a strong aroma of pink grapefruit juice concentrate. I got some rock salt, too. The flavors were thick grapefruit juice and guava nectar at first, then there were honeyed notes as it opened up, and minerality and citrus pith as it warmed. I kept thinking that this was a wine that they would recognized in the Middle Ages, which (from the descriptions I've read) was mostly thick and mostly cloudy. I'm glad that I took the opportunity to open this wine now, because I have another bottle of it and I will save it for a night when all I ask for is a non-boring wine. This is most definitely NOT boring, and reminded me of what Open That Bottle Night is all about: wine is meant for drinking. So just do it.